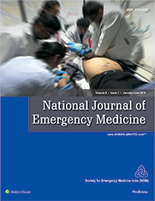 The National Journal of Emergency Medicine (NJEM) is an Open Access journal, published by the Society for Emergency Medicine India. This journal is directed towards emergency physicians, doctors and postgraduate trainees working in emergency departments in India. It covers emergency medicine, resuscitation, disaster management, pre-hospital care, emergency pediatrics and public health & legal issues related to emergency medical care in India. NJEM publishes research from both urban and rural emergency departments, from both private and govt hospitals in India. It highlights interesting clinical cases, disease profiles, patient statistics, clinical improvements, evidence-based practice, and various research findings mined in the field of emergency medicine. The National Journal of Emergency Medicine is a platform for research findings and best practices to be shared, with an intention of progressing the specialty of emergency medicine in India. NJEM is a peer-reviewed and open-access journal (free) which is funded by the Society for Emergency Medicine India. It is published quarterly and is accessible online at www.njem.org.in. The print version is available to all SEMI members. Society for Emergency Medicine India (SEMI) is a registered society formed in 1999 with a single goal of developing emergency medicine in India. SEMI is a full member of the International Federation of Emergency Medicine (IFEM) and is the only organization representing India in the global emergency medicine community. National Journal of Emergency Medicine, a publication of Society for Emergency Medicine India (SEMI), is a peer-reviewed print + online Quarterly journal.